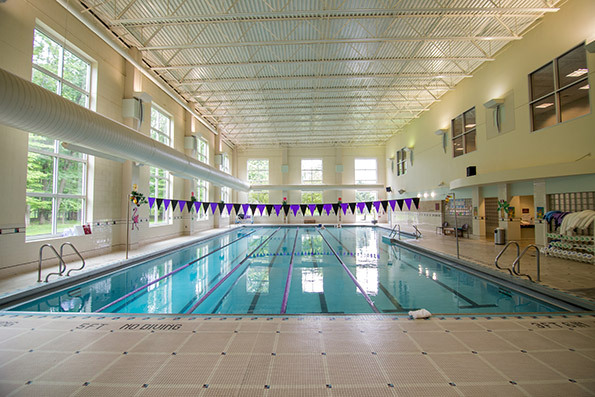 LifeWorks has a Junior Olympic size 6-lane Lap Pool (81-83°) and a Warm Water Therapy Pool* (91-93°). LifeWorks strives to offer members both lap swimming as well as a variety of water exercise classes. LifeWorks is an adult only facility, but we do offer Family Fitness to our members Saturday and Sundays 1-5pm. We do our best to have at least one lane open for lap swimming throughout the day. The Aquatic Center does close 15 minutes prior to closing each night. Contact our Aquatic Supervisor for more information. Our water exercise classes are included in membership. Please refer to the group exercise schedule for times and days. These ongoing classes are held in our Warm Water Therapy pool (91-93 degrees) and are free to our members throughout the week. Warm Water Pool Limited Use during times of physical therapy we ask the members refrain from pool use. Mondays: 10-12:15 p.m., Tuesdays: 4-5:30 p.m.
Wednesdays: 10-12:15 p.m., Thursdays: 4-5:30 p.m.
Fridays: 10-12 p.m. & 3-4 p.m. Contact our Aquatic Supervisor for more information. Standard for all Pools: Please rinse off (shower) prior to entering any pools. Time for Laps: When you arrive to swim, please see the lifeguard. If lanes are full, they can assist you. When there is a waiting list, lap lane use will be restricted to 45 mintues. Sharing Lane: This is not for everyone, but if you are able to share a lane please let the lifeguard know. We appreciate the courtesy. Respect Others: Avoid wearing any perfumes or colognes. The air is very humid and smells are stronger. Others may have allergies or sensitivity to certain odors. On Deck: Food or eating in the aquatic center is prohibited. Spotless and well maintained facility, wide variety of classes, knowledgeable, friendly staff, tons of machines, weights, equipment. Love it all. I have been a member of LifeWorks for over 5 years. This gym has been a great place to get fit and meet new people. The variety of classes and exercise equipment always keeps things interesting and make my experience at LifeWorks enjoyable.